Abzan is a deck I've wanted to try for some time but usually you will see at least 3 copies of Liliana of the Veil in Abzan lists (which will set you back a long way). Ray Wee's decklist is interesting in that it managed to be very successful without the powerful black planeswalker. As someone who is a fan of sweet lists and not shelling out for a playset of Liliana of the Veil this was a deck I just had to try. The creatures in are deck are big, really big. This by no means an accident - all being well our creatures cannot be killed by a simple Lightning Bolt, which makes them difficult for opponent's to deal with. Goyf was reprinted in Modern Masters 2015 but still remains one of the most expensive cards in Modern. I picked a playset of these up just before the set came out but haven't used them as much as I would like. The times I have used Goyf I wasn't as blown away as I wanted to be, however, this deck just feels like the perfect home for Goyf. Hand disruption combines excellently with a Goyf, ensuring it will be nice and large from Turn 2 onwards. Also, in combination with the other threats in our deck it can be a real beating. I've been keen to try out the Rhino since it starting make an impact on Modern but haven't really had much of an opportunity until now. Rhino's popularity has diminished with the banning of Birthing Pod and a move towards Jund decks over the once more popular Abzan decks. Rhino is still incredibly powerful and a massive beating. The life drain is a great way to mount pressure on your opponent's life total and the gain on your end helps mitigate the life loss from Thoughtseize and our fetchlands. 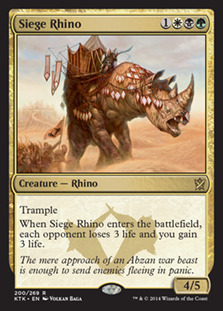 Trample is also a huge deal as it prevents opponents just chumping your Rhino to slow your progress. Thragtusk and Sigarda are 1-of five drops. Thragtusk is big dude that can boost your life total and is resilient in the face of removal. Sigarda, Host of Herons is another powerful threat. A 5/5 flyer is very powerful and Sigarda is also immune to removal. Her ability also protects you from opposing Lilianas, edict effects and Eldrazi Annihilator abilities. These two make for a very powerful top end to our deck. Technically the most expensive creature in the list but you generally won't be casting him for anything like his cost thanks to Delve. Tasigur and Tarmogoyf are not very synergistic but they just about manage to live in harmony. Also, Tasigur is just far too powerful to pass up on. Tasigur is not only huge but an amazing card advantage engine in a long game - which is something particularly hard to find outside of blue. We are using a combination of these two powerful one-mana hand disruption spells. Hand disruption can be very effective but it's even more powerful when you can gain further advantage out of it. I love how well Thoughtseize and Inquisition of Kozilek work with Tarmogoyf. You can use a Turn 1 hand disruption spell to grab another card type out of your opponent's hand to give you a 2/3 Goyf, add a fetchland into the mix and your Goyf is already Lightning Bolt proof. One of the best removal spells in the format. Not quite as good as Lightning Bolt but it has its own upsides in being able to take much larger threats, which seem very prominent in the format at the moment. 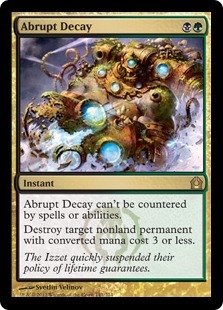 Abrupt Decay is an extremely powerful removal spell with a plethora of viable targets in the format and also has the advantage of being uncounterable. One of the best removal spells in the format. Lingering Souls serves a nice three drop for the deck. It puts additional pressure on our opponents and can help us break through a ground stall by flying over opposing creatures. I like Lingering Souls a lot and would consider playing more in this list - particularly as we are lacking a three-drop creature, leaving a bit of a gulf between Tarmogoyf and Siege Rhino. Filling Liliana's shoes is a big ask. So what did I think of Abzan Charm? I can't imagine you would choose it over Liliana given the choice but as a budget option Abzan Charm is a very good card. Exiling creatures of 3 power and over deals with a lot of the threats in the format - in my time playing the deck I've exiled Tasigur, the Golden Fang, a flipped Delver of Secrets, Gurmag Angler and Vendilion Clique to name some of the many options. I also like the option of an instant speed Night's Whisper at end of turn when you are looking to restock your hand. I have yet to use the final mode of the Charm so far though it may come up at some point. A pretty versatile card and one that I've found pretty useful. Pulse is an interesting one-of. A powerful removal spell that provides an answer to a variety of non-land permanents. It can also be a real blowout if you can destroy multiple permanents with it. These are our additional removal spells. 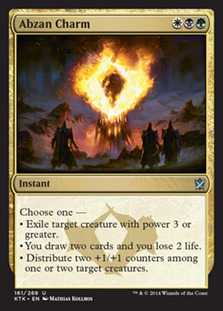 Dismember is very cheap, though as we can generate black mana we can vary the life/mana requirement as we choose. It is capable of removing the majority of the bigger threats in the format. 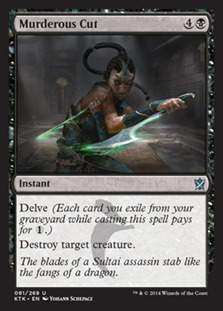 Murderous Cut then provides us with unconditional removal and is also very cheap provided we have enough cards in our graveyard to feed to it. Mass removal is an interesting choice for the deck - particularly as generally we are looking to dominate the battlefield with our large threats. I've had mixed experiences with Wrath/DOJ while playing the deck, varying from amazing to a complete dead card. That description in itself probably makes this a better sideboard card than a main deck one (unless the times it is amazing vastly outweigh the times it is a dead card). I would consider cutting Wrath in the deck but I'm not entirely sure what I would replace it with - perhaps more copies of Lingering Souls for the main. I played Day of Judgment over Wrath of God in my deck, which I appreciate is not exactly the same but I didn't think the price difference was worth the additional effort. Regeneration does not come up a ton in Modern - Lotleth Troll and Thrun, the Last Troll being the most prominent I can think of. The manabase is fairly self-explanatory if also a little bit painful with the number of fetches and duals. 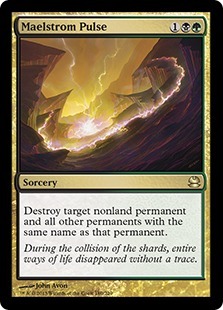 Life loss can be a concern with our lands, Thoughtseize and Abzan Charm's draw option causing considerably hits to our life total - fortunately Siege Rhino can help offset this to a degree but you do need to be careful. Treetop Village is a fantastic manland. It may come into play tapped but it makes green mana and is a powerful 3/3 trampler once activated, for the cheap cost of just 2 mana. 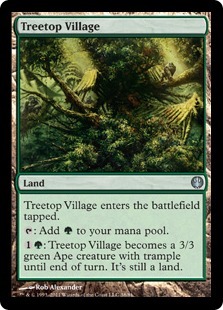 I have won more than a few games on the back of Treetop Village and it also works well as a post-Wrath beater. Thoughtseize provides additional discard for when hand disruption is pretty useful. It can also trade in for Inquisition in matchups such as Scapeshift where you want to grab a spell over the cost of 3 mana. 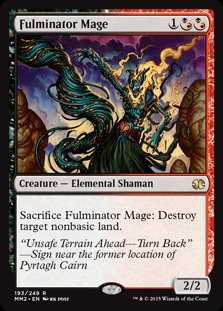 Fulminator Mage is a card I managed to pick up thanks to the Modern Masters 2015 reprint. It's been pretty impressive as a Stone Rain that can also be a beater in the right environment. Without Kolaghan's Command you won't get multiple uses out of it but it's still proved very good. A particularly strong card against Scapeshift and Tron. 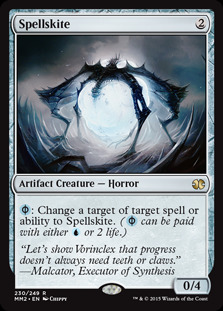 Spellskite is a sideboard all-star, providing a cheap blocker and being able to redirect removal spells and enchantments, such as Splinter Twin. Feed the Clan is primarily for use against Burn, giving you a sizeable life boost that will cost your opponent a serious number of cards. 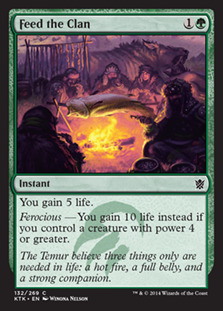 You can also use it against other aggro decks to buy time so you can get to your creatures and dominate the board. 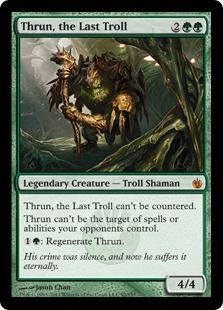 Thrun, the Last Troll is a great anti-Control card. A sizeable that is both uncounterable and very difficult to kill. Disenchant is an answer to enchantments and artifacts. As a one-of it is a bit of a token gesture in the sideboard but it's always good to have additional outs to potential problem cards. 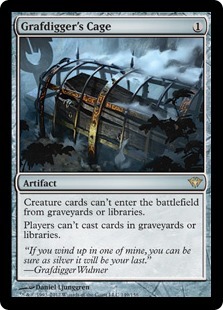 Grafdigger's Cage is a sideboard card that has increased in popularity as an answer to Collected Company decks. It also has various other applications, such as limiting Snapcaster Mages and turning off flashback cards. Scavenging Ooze is another powerful graveyard hate card and also a serious threat on the battlefield. Ooze could certainly make it into the main deck in the right environment. Our first matchup is against Jeskai Control. In Game 1, a couple of Tarmogoyfs and a Siege Rhino follow some early hand disruption and it's just too much power too quick for our opponent. Game 2 is a similar story but lacking the early creatures, however, Thrun, the Last Troll proves great out of the sideboard as a large threat that is very difficult for their deck to answer. Lingering Souls is also a very good card in this matchup, providing a threat that they will feel reluctant to counter due to our ability to flash it back. Our second matchup is against Grixis Twin. This match is somewhat similar to the previous Control matchup. The combo element does complicate matters but hand disruption and removal are both very good against Splinter Twin. Abrupt Decay is particularly strong as an uncounterable removal spell for Deceiver Exarch and Pestermite. Our third matchup is a version of Shaheen Soorani's Blink Riders deck. This is a very rogue deck but a fun and interesting one. The weakness of the deck is that it needs to maintain the pressure otherwise we can just stick our threats and finish them off. In both games I was able to stick my threats and finish my opponent pretty easily. Our fourth matchup is against Jund. This is a very interesting match because the decks are very similar. Our creatures general immunity to Lightning Bolt probably means that Path to Exile is more useful as a removal spell, though the deck is still removal heavy enough to answer out threats and Bolt can go to the dome to run down our life total. PureMTGO readers' favourite card from Magic Origins, and perhaps fittingly for the last Core Set, was an exciting reprint. Goblin Piledriver, an old favourite from Onslaught, looks sent to give Goblin tribal a huge boost in both Standard and Modern. Taking Silver is Kytheon, Hero of Akros and his planeswalker alter-ego Gideon. The vote was very tight for some time between Piledriver and Kytheon but eventually Piledriver managed to pull away. The flip planeswalkers are marquee cards for the set and Kytheon/Gideon seems to be the one people are most excited about. Shaman of the Pack was also a late riser coming out slow but ended up as the emphatic winner of the Bronze here. Obviously Elf Collected Company fans are in attendance and excited by this card - as am I. My number one pick for the potentially most impactful card on Modern, Day's Undoing, managed to nab joint 4th place. This is a card I'm really excited to get my hands on and see just how good it can be. I was a bit worried I overrated Animist's Awakening as the more I think about it the more I feel the variance of the card will make it unplayable. However, the audience has shown some love for Animist's Awakening which seems to indicate I'm not the only one who sees the potential. Thank you to everyone who took the time to take part in the poll. I felt it was pretty successful as a first attempt and I'm glad people took the time to take part. I'm sure I'll take the time to poll you again at some point in the future. Also, the poll is still open until the end of the month I believe if you fancy swaying it late or you want to see the full results. I have had a lot of fun running this deck and I've been impressed by its power. If you have Liliana of the Veil then I would definitely play her and I look forward to the day I can afford a playset but there are some very reasonable substitutes for her slots. The deck still feels very powerful and I've had a good amount of success against a variety of decks. 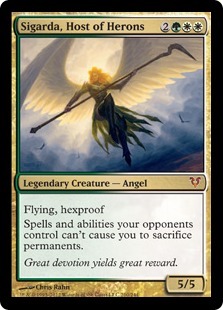 I would consider cutting the Wrath of God/Day of Judgment though it seems like a solid sideboard card. Abzan Charm was surprisingly good as a removal spell and/or an instant speed card draw spell in the deck and gave us some great options. Abzan feels like a very strong deck and one that has the advantage of not having any really terrible matchups. It may occasionally fall foul of the unfair decks of the format but it is a powerful deck with access to a lot of answers. This article is my 101st article for the site, which is quite a milestone - obviously my last article was my 100th article but I hadn't realised until now so thought I'd mention it. If you fancy checking back over my past 100 articles - starting with Heirloom PRE Tournament Reports, moving to the start of Becoming A Modern Man, set previews, occasional Standard articles and some Modern Musings. I hope you enjoyed this article and I will be back with more soon.